This tutorial is broken up into 4 different posts in order to give you as much step by step direction and detail as possible. Click the highlight links above each picture to see the process documented in each post. Also be sure to refer to the Frequently Asked Questions below! Continue below for FAQs, border tutorial, and more pictures of the final blanket! How long did it take you to make? I started this blanket is early April. It is now the end of May so just about two months. 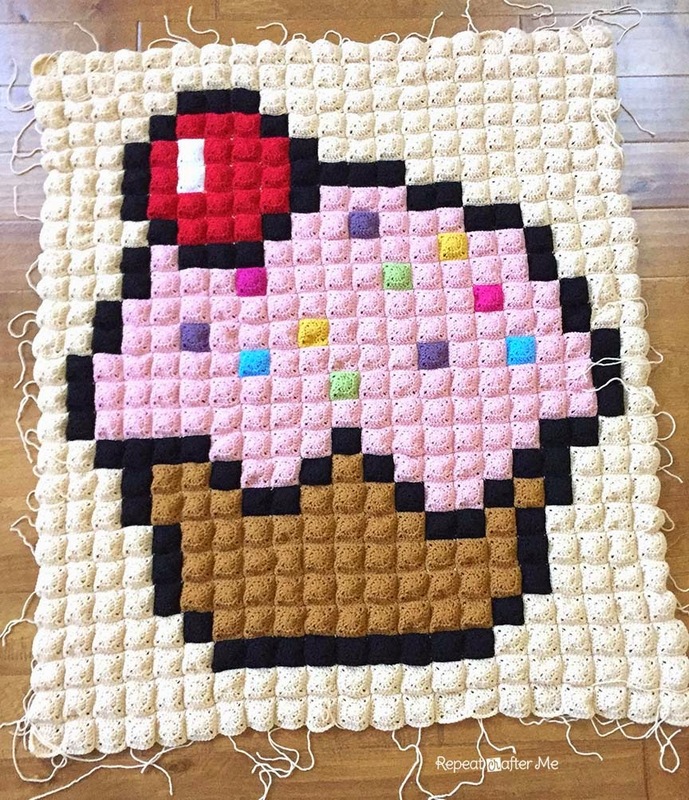 I was able to make 20 squares in 1 hour (uninterrupted) but of course I was never able to crochet for an hour straight… so just the squares took me over 50 hours. Then I wove in the ends, laid out the squares, joined the squares, and made the border. But all those ends?! Not gonna lie, this project is tedious but so worth it when it comes together. In my opinion weaving in those ends was the easiest and quickest part! 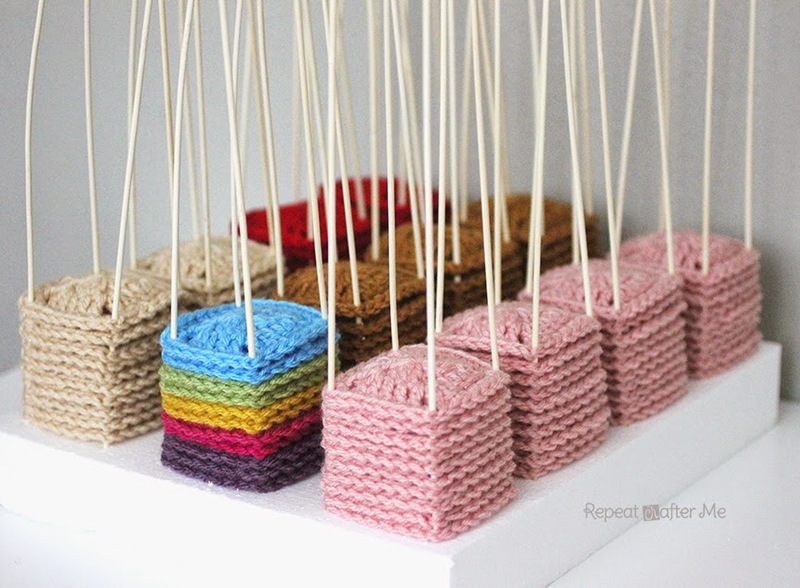 The bulk of my time was spent repetitively crocheting the squares. Even joining took longer than weaving in the ends. Two ends to weave in on each square didn’t take long and there was a quick sense of satisfaction after each square was finished. How much yarn do I need? One skein of Lion Brand Vanna’s Choice makes about 20-21 squares. I made a total of 525 squares so that is about 25 skeins just for the squares. The joining will take 2 skeins and then another for the border. I used: Lion Brand Vanna’s Choice in these colors: Beige (approx 15 skeins), Pink (approx 6 skeins), Scarlett, White, Black (approx 4 skeins), Honey (approx 3 skeins), Dusty Purple, Aqua, Mustard, Fern, and Raspberry. 1 skein or less of the ones that I didn’t specify. Where can I find a pixel graph? Perler bead patterns (try THIS website) make perfect pixel graphs! Read more about it HERE. How do I join the squares? 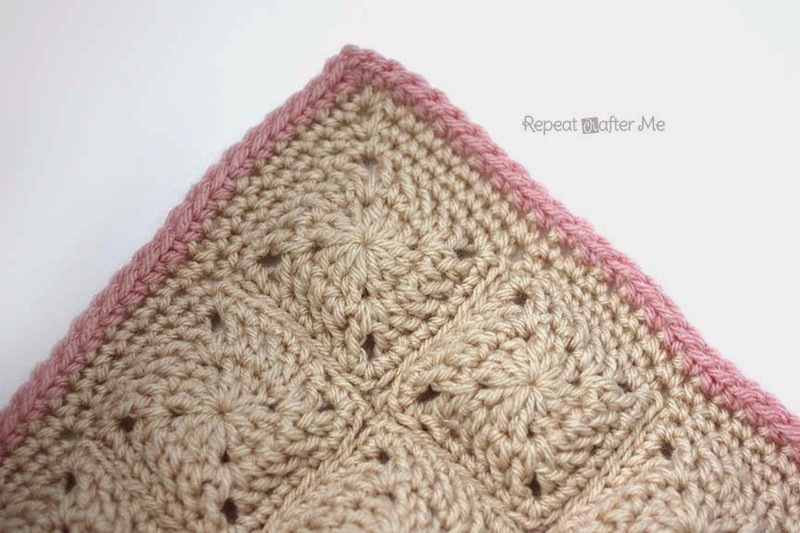 I used THIS technique by Petals to Picots to join my squares. 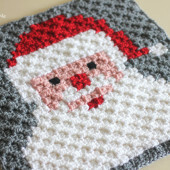 You can read all about it my Pixel Square Layout and Joining Post. You don’t have to use this method. Feel free to join as you go. How big is the blanket? The finished blanket is 63×53 inches and fits perfectly over a twin size bed! How big are the squares? Each of the pixel squares measures 2.5×2.5. If they start curling you may want to block or dock them. Check out my Pixel Square Docking Station! What does the back look like? Because of the way I slip stitched the rows together, the squares are bordered on the back. I actually really like it and it has a cool texture but if it bothers you, you could line it with fleece or use a different joining method. This is what the back of the blanket looks like! The pixels do puff out a little but I really like the dimension it adds to it! Is there a way to adjust the size of the design so it’s less pixels? 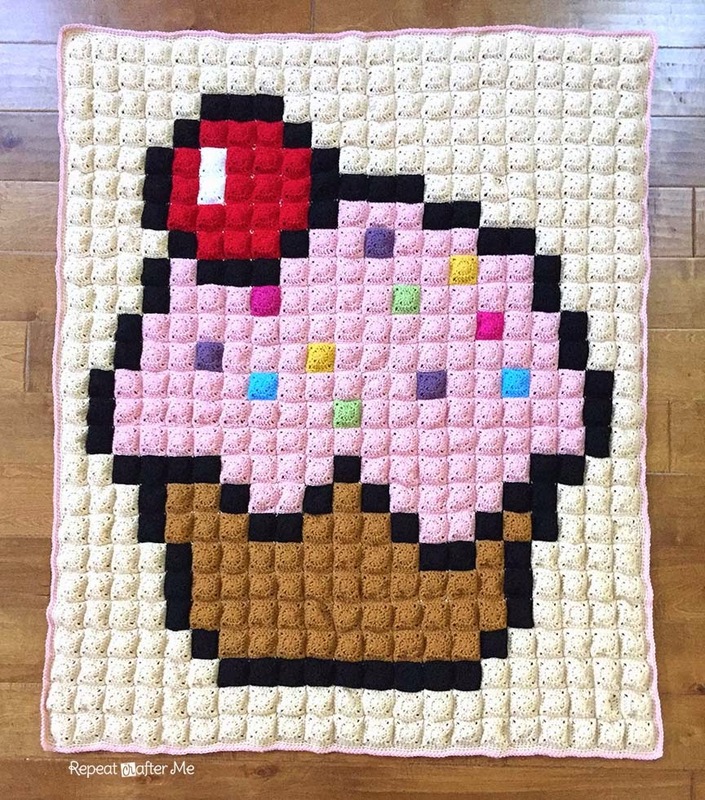 The only way to adjust the size of a pixel blanket is by adjusting the size of the squares (use a smaller hook and lighter weight yarn… also the squares I used are smaller than the average granny square). 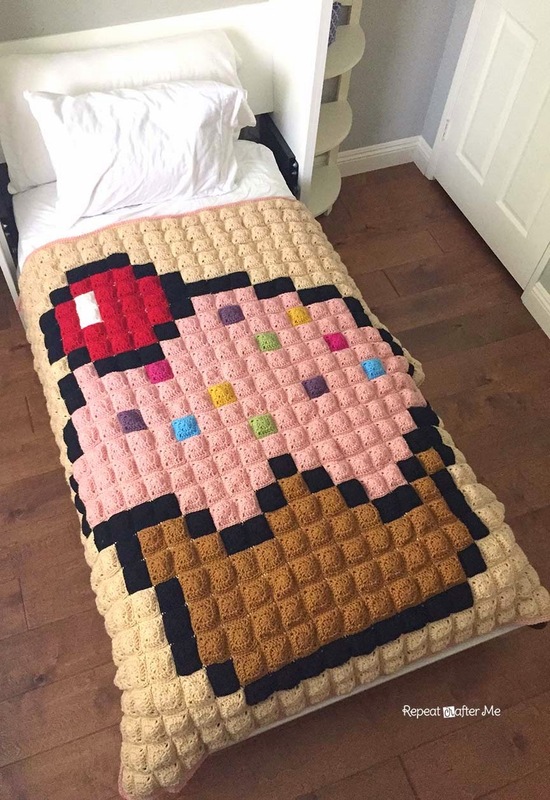 A pixel blanket is just what the name says… made of pixels. Just like in a photo, the less pixels you have, the less detail you have. 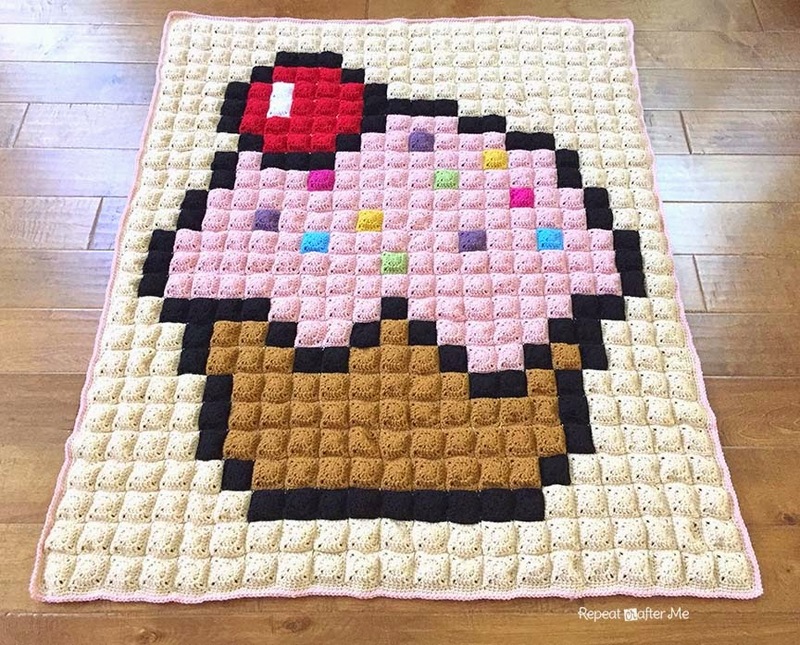 Believe me, I tried to alter this cupcake design, but you really do need all these pixels to make the picture work. If you want to make a blanket with less pixels, you may want to choose another design with less pixels. For instance THIS FOX PIXEL BLANKET only has 132 squares. Now lets talk about the border! Sometimes all you need is a simple single crocheted border. With all the different elements in this blanket, I didn’t want to over do it with a fancy edge (although I did consider doing a scalloped border). So I did 2 rounds of SC in beige and one round of SC in Pink. When you get to the corners, make SC + chain 1+ SC. I suppose I should also mention that when I wove in the ends from joining each row, I made sure to weave my loose end through the corners of the squares to bring them together. 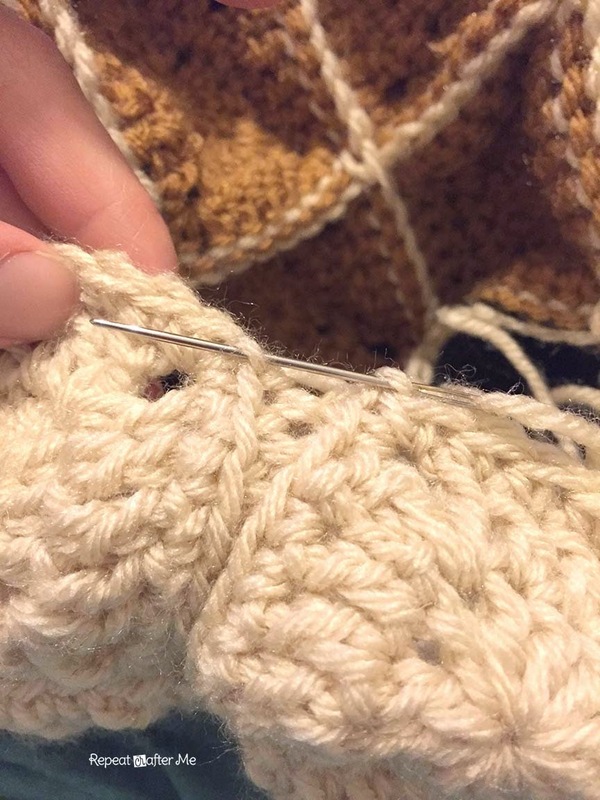 When crocheting your border you don’t want any single crochets to land in between squares so try and close that gap as much as you can. This blanket would be so sweet a little girls room! 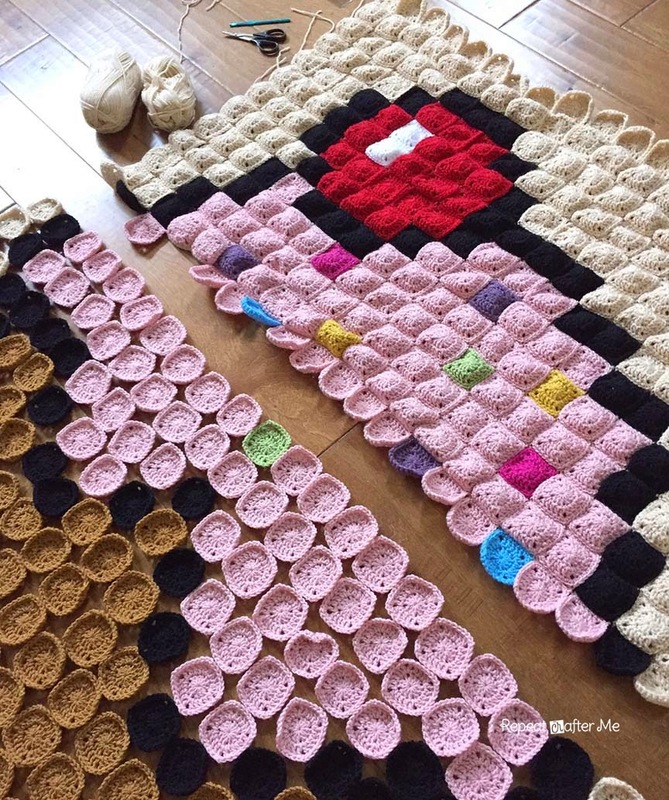 I hope you’ve enjoyed seeing this blanket come together! Can’t wait to see the pixel projects you are working on! Want more free patterns? 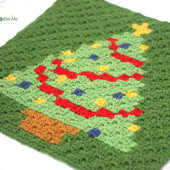 Keep in touch on my Repeat Crafter Me Facebook Page for new pattern sneak peeks and when they will be available on my blog! And feel free to post pictures of your finished hats and/or links to your shops on my Facebook wall so all can see. Be sure to also follow me on Instagram! I love when you tag me (@repeatcrafterme)! NEW!! 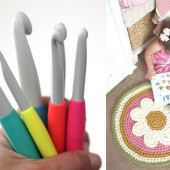 I would love for you to join my brand new private Facebook group: Repeat Crafter Me Crochet. Tons of kind and supportive women with crocheting skills of all levels. Post your current projects, ask questions, and get inspired! I have been waiting to see the results and it is precious! I love it! Thanks for sharing! How beautiful is this! !…Thanks for sharing, I've been waiting for it.. Absolutely amazing !! I love it! It's amazing & so big!! I love how it puffs up, is that because of how you joined them? Gorgeous blanket. Nice to see how the blocking works great. Thanks for sharing. I love this!! I mada a similar one this year for my nephew. I called it "The Pixelated Parrot"! Just AMAZING!!!! So much work but the result is PERFECT!!! Congrats!!! That's so awesome, you did a fabulous job! 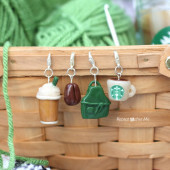 I love how these look but I will never make one myself because I don't have the patience for putting all those little pieces together, so I am in awe of your skills lol. Simply beautiful! You must have the patience of a saint! Wow, Great job on that, really amazing great attention to detail! Love it!!! Hi, I love the blanket. I want to choose my own pixel pattern but they all come in different sizes like 45×41. The one you made I think it's 25×21 and thats good for me. 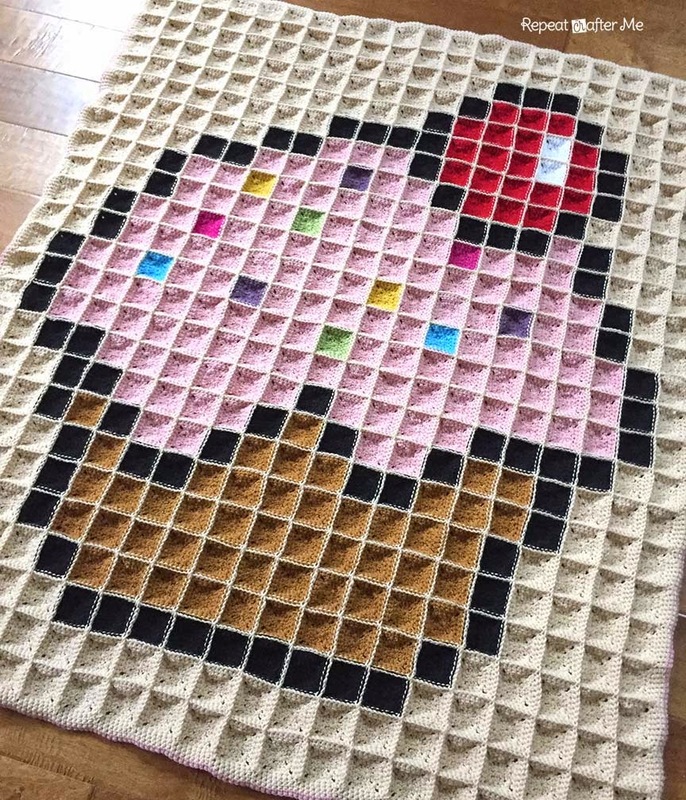 Do you know how I can edit these pixel patterns? thanks. I always use my ends to join my squares. When I finish off each square, I take the time to weave each end in just a bit, making sure to have it come out at a corner. I make sure the end is long enough to attach two sides (halfway around). 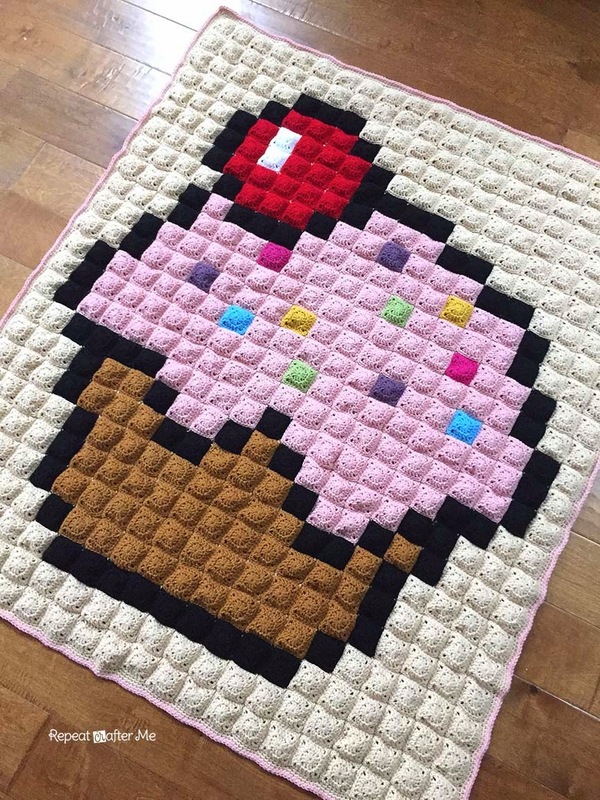 I am just about to start this beautiful project and have counted up all the squares so I know how many of each to make and was wondering whether people wanted to know without having to count them themselves…. I’m just using basic colour names…. 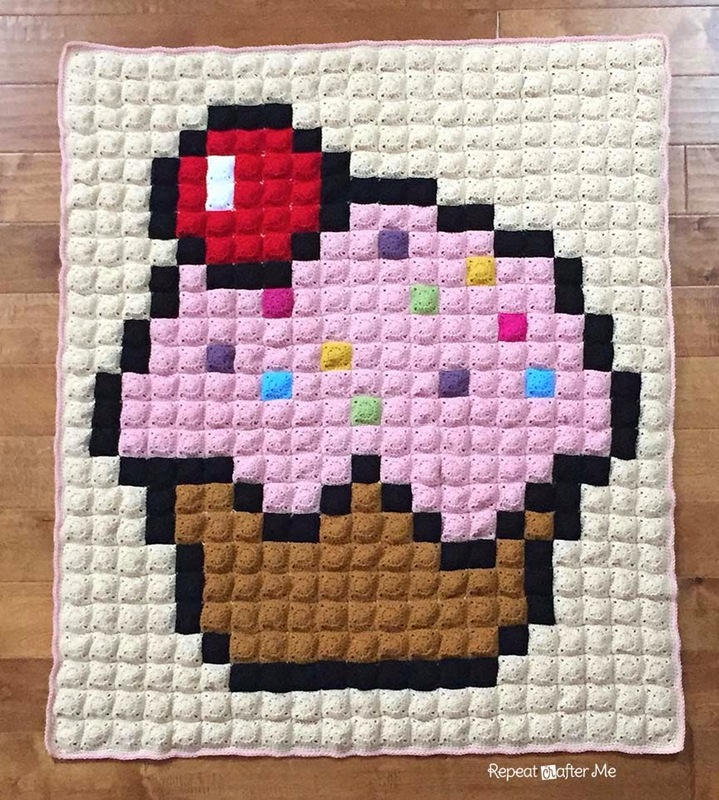 I just started crochet a few months back and this blanket really spoke to me, wow! I was gifted a lot of cotton yarn. 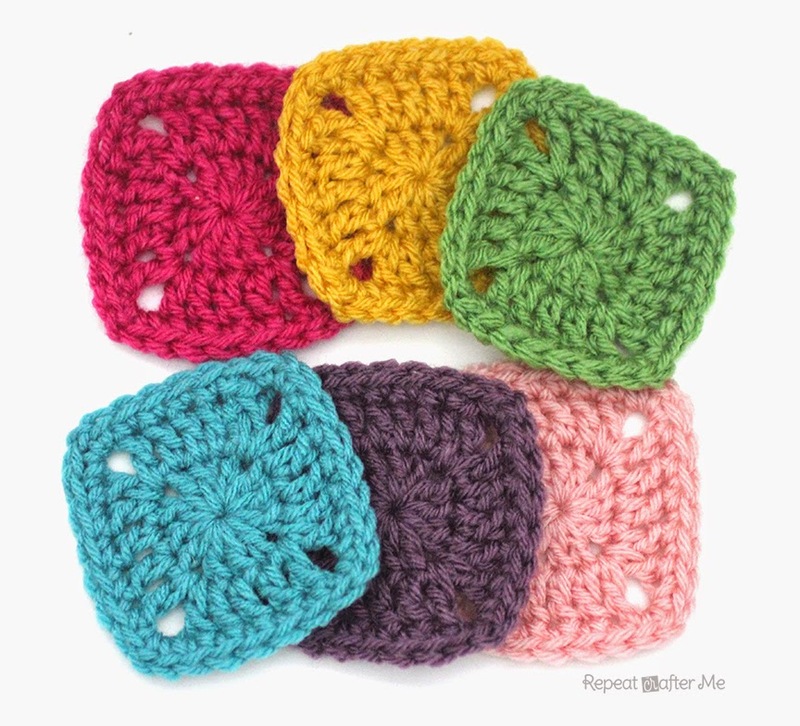 Do you think.it is possible to use it instead of acrylic yarn? Or would it be too heavy?